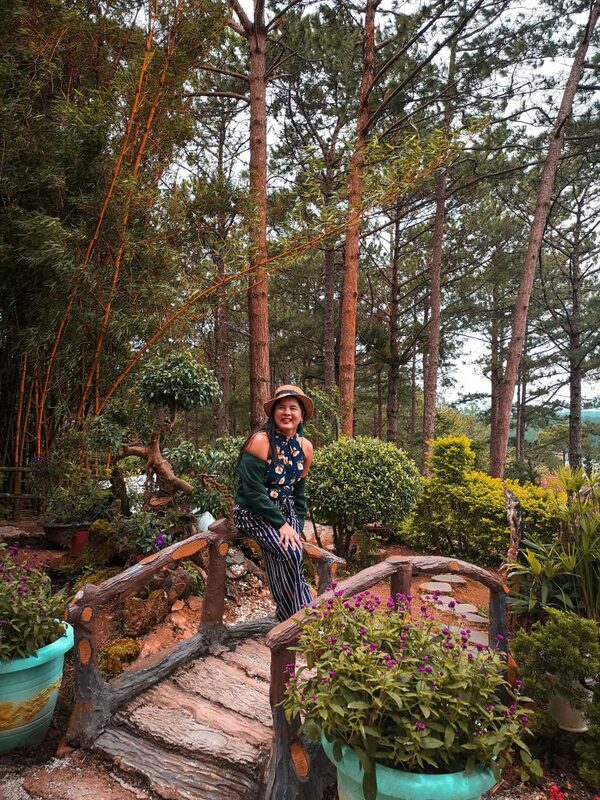 Just as the city of Da Lat in Central Highlands of Vietnam knows how to tickle your taste buds, the place knows how to tame and awaken your adventurous souls as well. The best part is that all of these things to come at affordable prices. 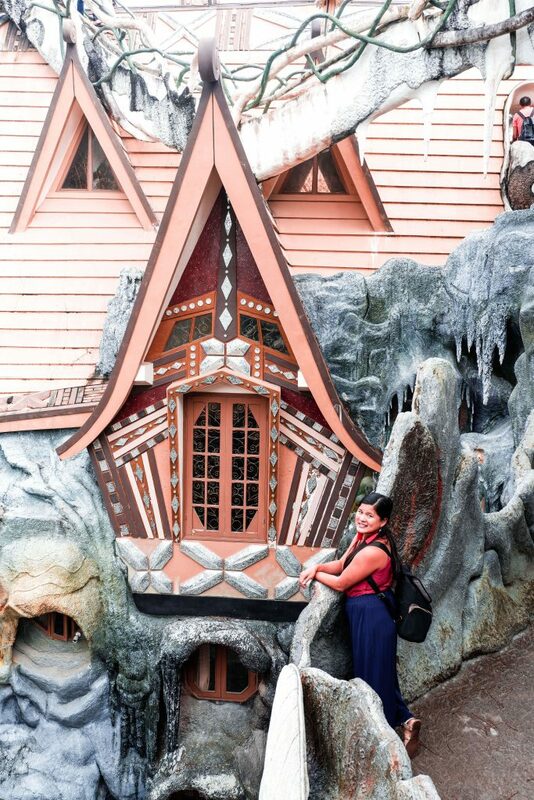 We were glad we had three days to spend in Da Lat because we really enjoyed the coffee culture, the whimsical houses and bars, chasing waterfalls and more. Regardless of your jump off point or destination, the most common mode of transportation getting to Da Lat is by bus. Available buses are mostly decent and equipped with aircon, sleeper coach and WiFi. From the southern coastal town of Mui Ne, we took a 7 AM bus heading up north to the highlands of Da Lat. It takes four and a half hour, and the fare is 120,000 VND (5.USD/ 280 PHP). As opposed to the sleeper ones we were hoping to get, we were only able to get a seater bus. We booked our bus tickets through the Sinh Tourist. You may book your ticket by visiting the local branches or on their website. If you’re coming from Ho Chi Minh City, take Futa Bus Lines. Travel time is around 7 hours; night travel may be faster. Fare budget is around 180,000 VND ( 8 USD/ 420PHP). The most convenient and fastest way to reach Da Lat is by air. 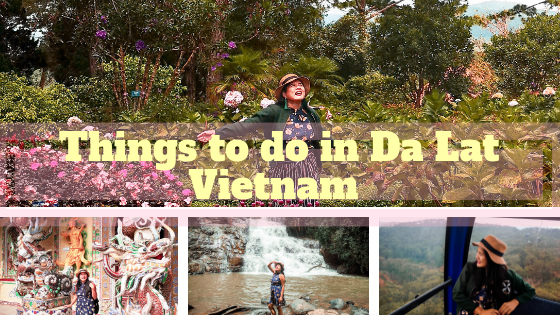 Da Lat is serviced by Lien Khuong Airport which currently caters to domestic flights to and from at least five major cities in Vietnam including Ho Chi Minh and Hanoi. Airplane tickets come cheap with a price range of USD50 to USD100 (2,700 to 5,400.00 PHP). You may get it even cheaper during low season. 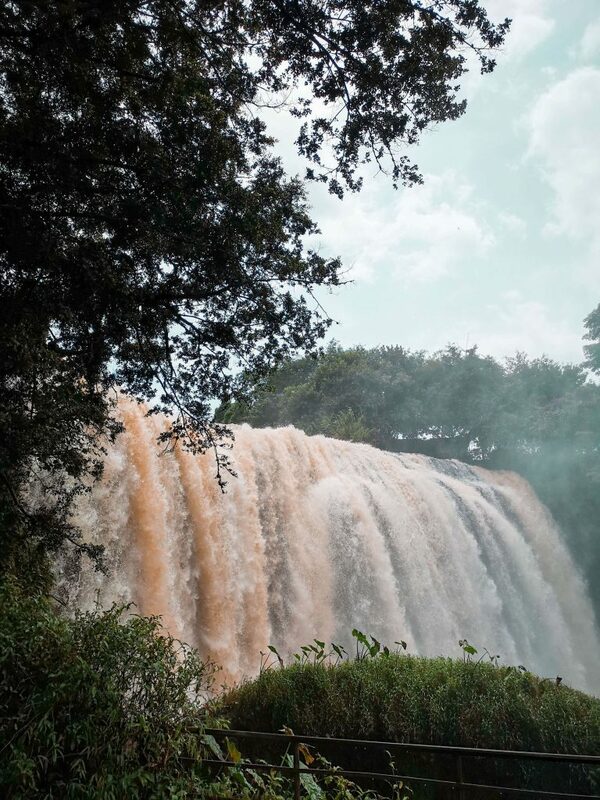 The Elephant Falls in Dalat is like a little Niagara Falls in Vietnam. Like the Niagara Falls, it has powerful water flow and soothing sounds. To get here, you need to trek down into slippery rocks and stairs. Along the trail, there is a blue railing which travelers can hold on to. It can be handled by novice trekkers, and takes only around 5 minutes. 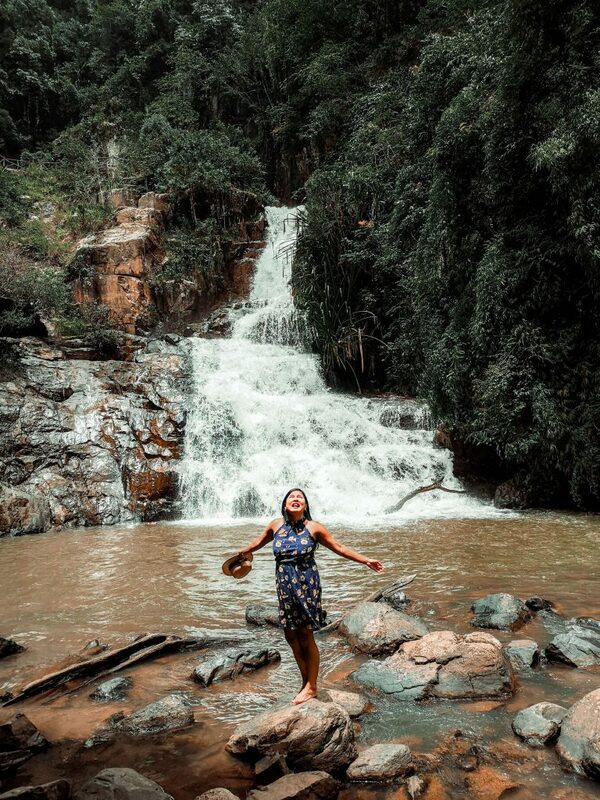 Once on you reach the Elephant Falls, you are welcomed by Instagrammable falls. At its foot are huge rock boulders blanketed with green moss. Be warned, I was wary about taking my camera out because the mist was so strong and I was worried for my lens. It may be smart to bring a go pro. From the viewing platform, turn left and squeeze into the hole leading to a small cave with huge tree roots as its roofing. While inside, you get sprinkled by water coming from the Elephant waterfalls itself. Entrance fee is around 20,000 VND (0.86 USD/ 50 PHP). Its trail is open from 8 in the morning, until 4 in the afternoon. Though undeniably one of the best waterfalls in Da Lat, the Pongour Falls is one of the least visited by tourists because its location is farther as compared to the other waterfalls. Likewise, its water level is now lower than before the dam in the upper area was built. Every rainy season though, the dam releases excess water. This excess water runs down to Pogour Falls, thus raising its water level, allowing it to show its beauty in full blast. The Pongour Falls gets mostly local residents who visit in huge groups every Tết or Vietnamese New Year. In Pongour Falls, you’ll need to pay at least 10,000 VND ( 0.43 USD/ 23.16 PHP). It is best to get a local guide to accompany you to the best viewpoint regardless of the season. The trail to the Pongour Falls is open at 7 in the morning until 5 in the afternoon. The Datanla Falls in Da Lat is one of the busiest waterfalls. This is where the action happens. Here, you can rappel, jump off from boulders, and go canyoning. It is best to hire a licensed tour agency to accompany you. It usually costs around USD50. Ruth and I were not dressed for this, plus the weather was rainy and freezing, so we decided to just skip the adventure. There are many ways for you to reach the waterfalls. You may opt to hike, or ride the Alpine which I enjoyed and would highly recommend. It felt like the Luge in Singapore but with coaster tracks. Return tickets cost 150,000 VND ( Php 350/ 6 USD); one way ticket in case you decide to hike down costs 100,000 VND ( Php 232/ 4 USD). I suggest you take the alpine coaster return. The going down is more fun and thrilling than going up . 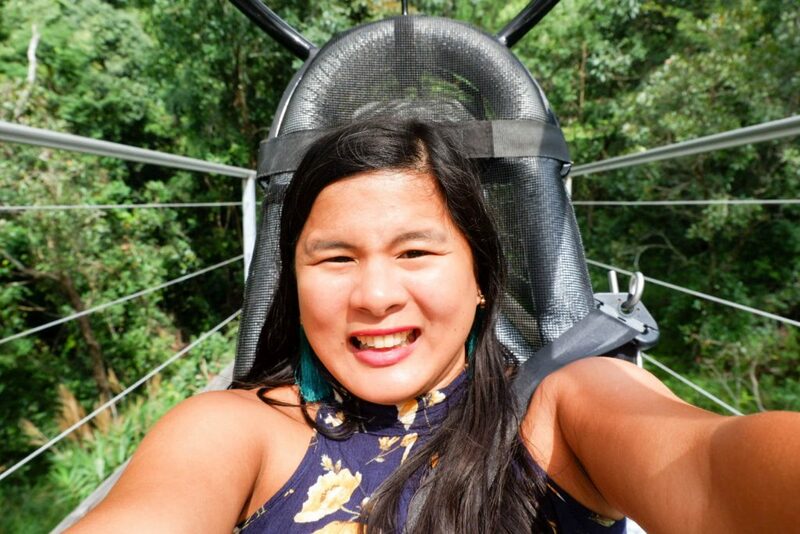 The Alpine coaster will take 2 pics of you — its marked on the trail saying photo stop. You can buy it for 60,000 VND ( 2.50 USD/ 140 PHP). It includes a printed copy and a soft copy by email. I normally don’t buy these things but since it was reasonable, I made an exception this time. To get to the Truc Lam Zen Monastery, ride a cable car from Robin Hill. The latter is a good viewpoint to the mountainous area of Da Lat. 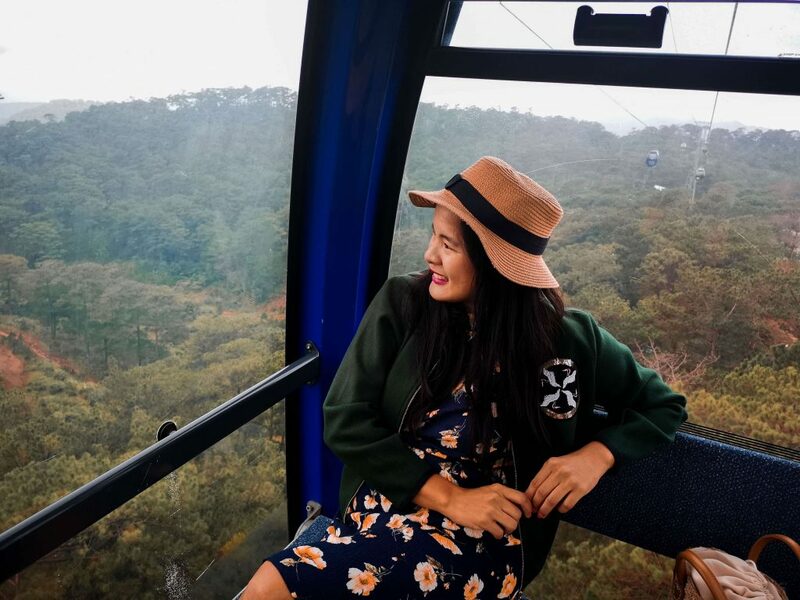 The cable car ride is scenic as it passes by the farm area of Da Lat. The Truc Lam Zen Monastery is a beautiful sanctuary of at least a hundred monks. It houses pine trees, temples, and gardens. We took a cab from our hotel to Robin Hill where we could ride the cable car. The cable car costs 80,000 VND ( 3.5 USD USD/ 185 PHP ) for roundtrip and 60,000 VND ( 2.5 USD/ 140. PHP) for one-way. Remember that Truc Lam is a Monastery and proper clothing should be observed. I was in a dress; fortunately, I put pants in my bag just in case, and that saved the day for me. Bring a jacket as well, as weather gets cold sometimes. 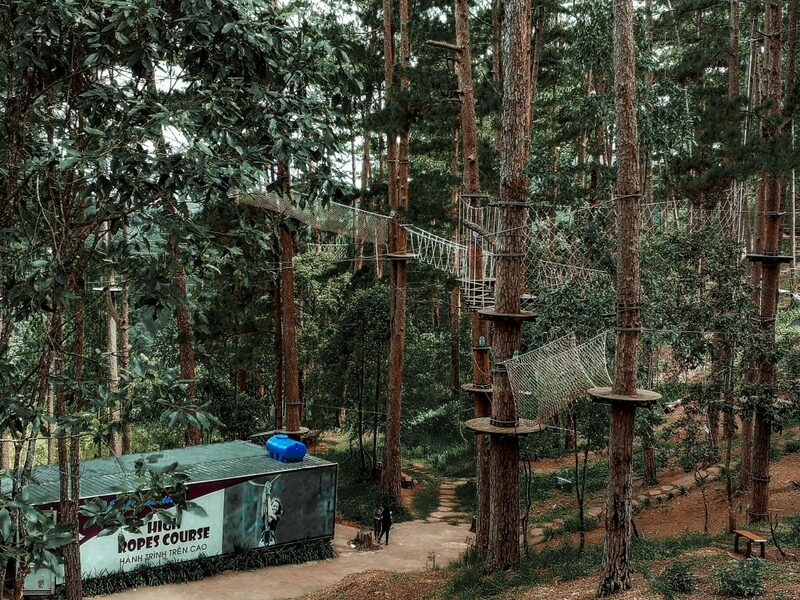 For more exciting activities, I highly recommend the Datanla High Rope Course Adventure Parks. The adventure park has been managed by the Lam Dong Tourism Company (Dalattourist) since March 2015. 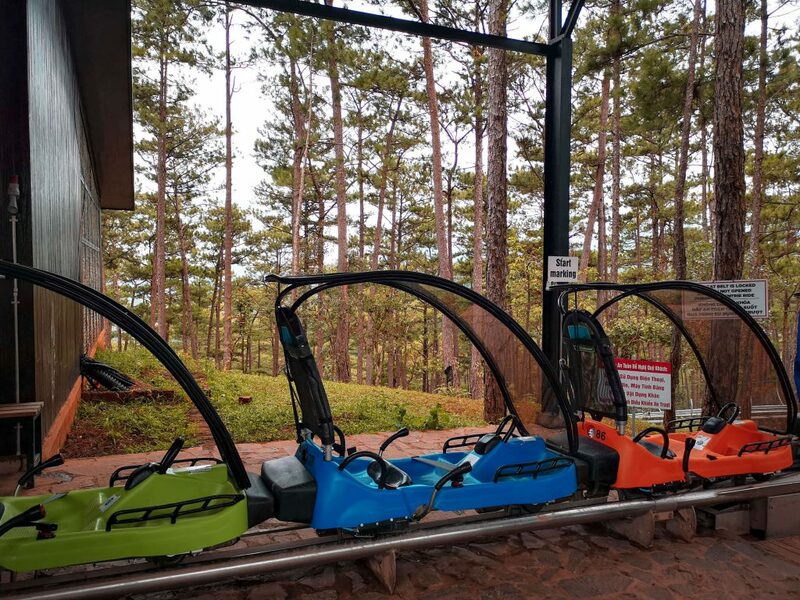 To ensure the quality and safety of its guests, the adventure park uses modern facilities. Their on site guides and staff receive their training at the Bali Treetop Adventure Park in Indonesia. Here at High Ropes, there are 3 to 8 courses, with 8 to 16 challenges each. Examples of the challenges are ziplining, suspended bridges, barrels, and so on. There are courses specially designed for children, adults, beginners, and professionals. I wish I had known about this early on because if I did, I would definitely have added more time for it in our itinerary. 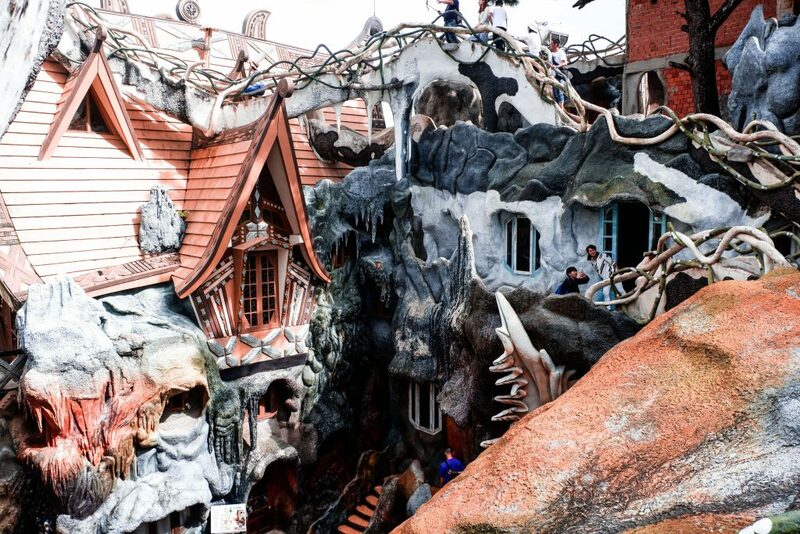 The name of this attraction is befitting because it really is a crazy house. It feels like a maze; everything is just unique and different, as if you are in fantasy land. 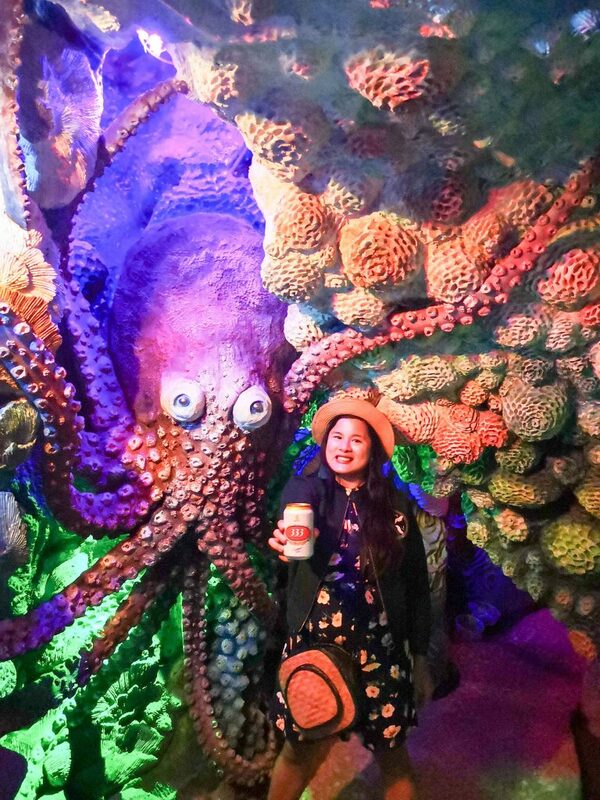 Taking a tour here reminds me of Alice in Wonderland. The Crazy House is still under construction and is expected to be completed by 2020. When visiting, expect construction works to be on-going in some areas. 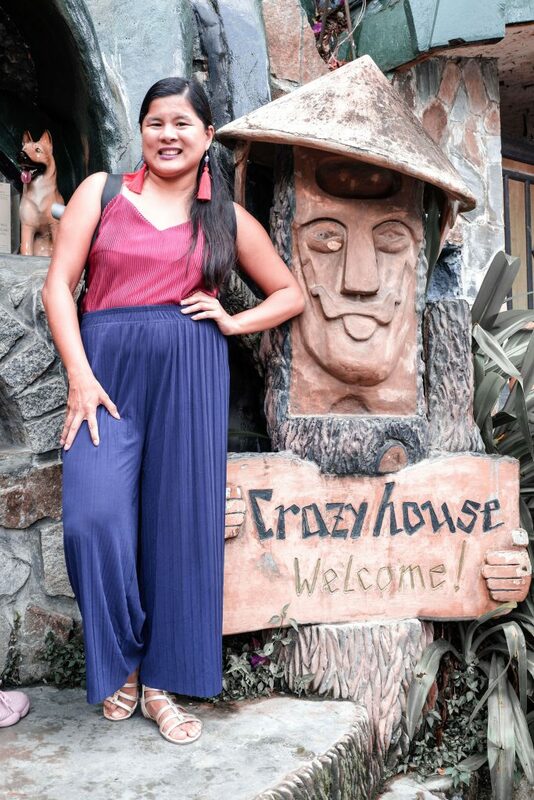 Aside from being a house museum, Crazy House also opens its doors as lodging. Overnight accommodation costs around 29 to 63 USD (1,570.07 to 3,410.85 PHP). We just visited for around 2 hours, but it is an option for you to stay at. 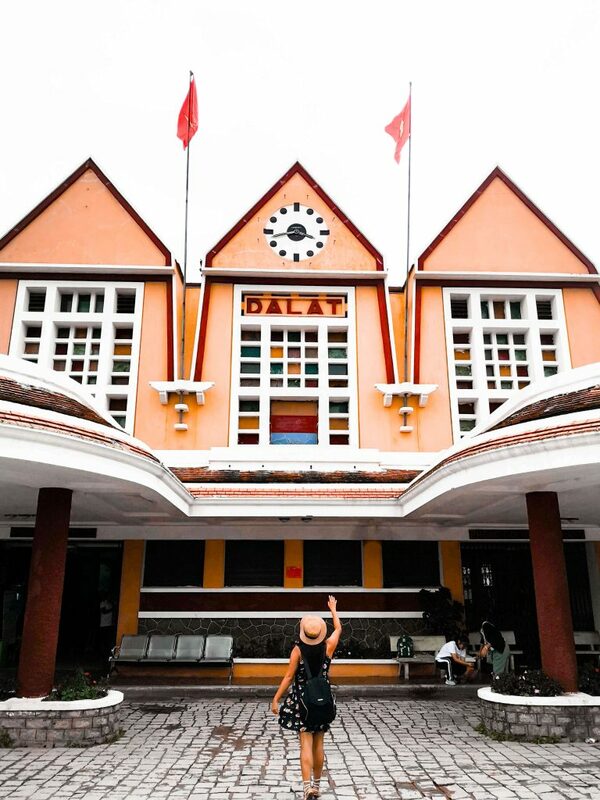 The Dalat Railway Station is an old train station designed by French architects. They incorporated French Art Deco architectural design with Vietnamese Central Highlands roofing style. The cost of the train ticket depends on your coach of choice. Below, you will find the rates. The prices range from ______ to ______. We opted to go for the soft seats as there were less people. I am not sure if it is always the same, but for our particular departure, the hard and VIP areas seemed to be full, while we had a lot of space. There are 5 trips per day. Make sure to double check the schedule, especially for your return trip. The Linh Phuoc Pagoda was first constructed in 1952 but underwent renovation in 1990. Additional buildings were added, and it was eventually turned into a modern temple complex. I loved the details of the Lin Phouc pagoda. 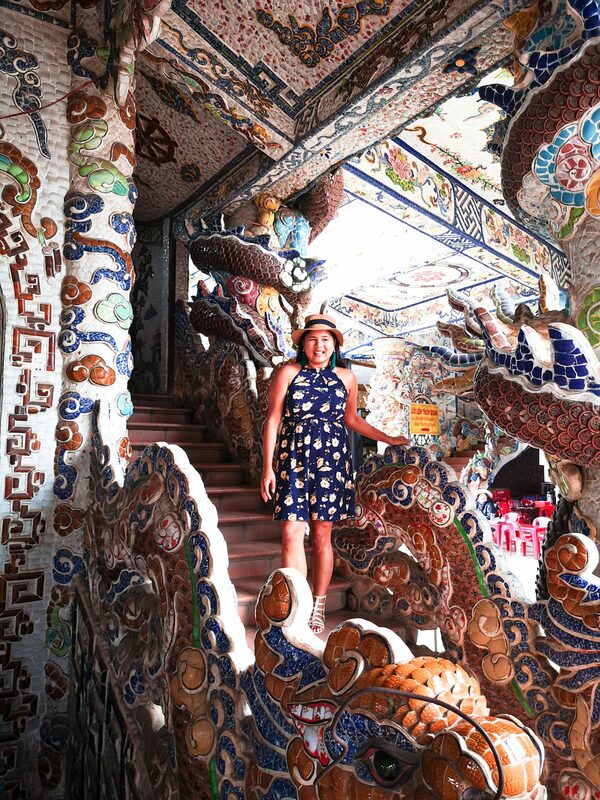 The most noticeable feature is the huge dragon made out of roughly 12,000 beer bottles. Inside, there are more mosaics which speak of the historical accounts, particularly of the Shakyamuni and the Lotus Sutras. 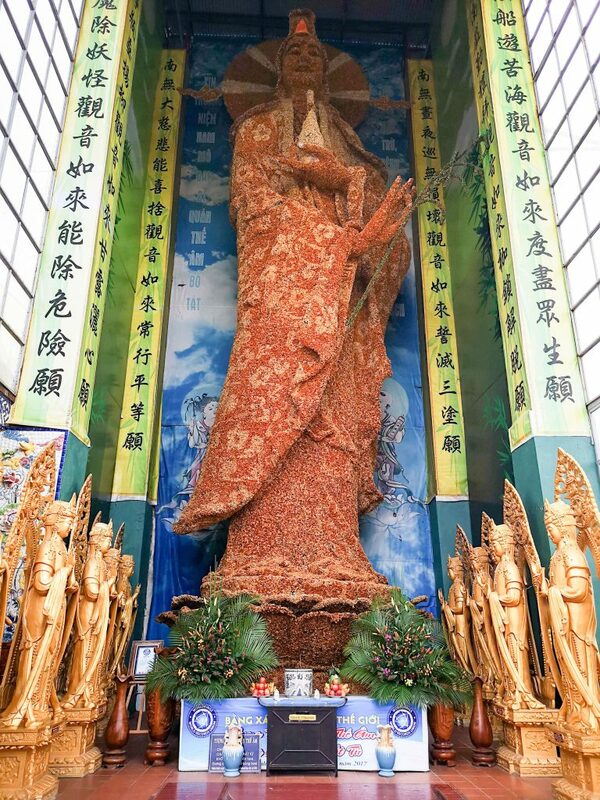 Other noticeable features inside are the lady counterpart of Buddha made up of 650,000 flowers, and the largest bell in Vietnam. The Linh Phuc Pagoda actually houses a long list of Vietnam’s “most”, “best”, and “largest” in terms of structural features. 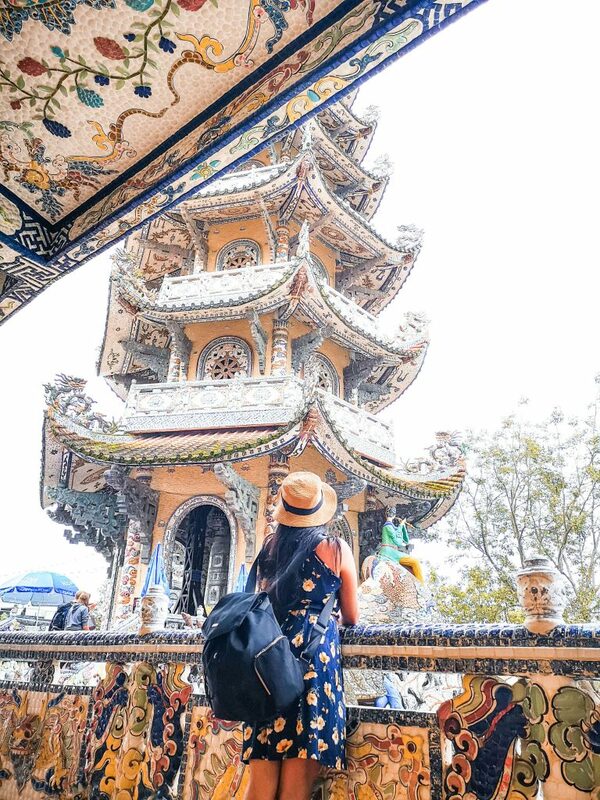 Visiting the Linh Phuc Pagoda is free-of-charge. To get here, as an alternative to riding the old vintage train, you may take a taxi from Da Lat city proper. Taxi fare for this route can cost around 100,000 VND ( 4.28 USD/ 231.6 PHP) to 120,000 VND. Note that when taking the train, you will only have 30 minutes to explore the area. Ruth and I felt quite rushed, though if you have time to spare, you may wait for the next train in another hour or so. 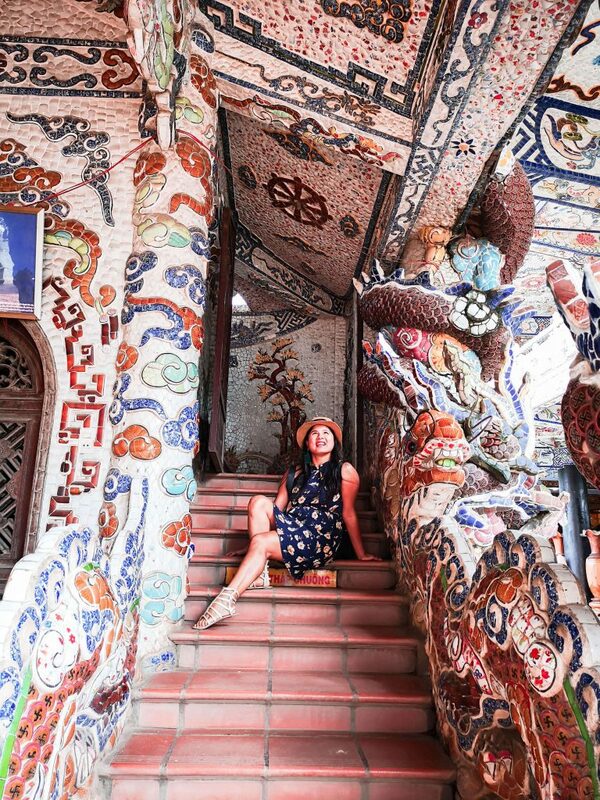 You won’t be able to help but smile back at the giant Happy Buddha as it sits in the Linh An Pagoda. It is another temple complex you should not miss visiting. The 50 feet tall Happy Buddha best represent the ambiance of the Pagoda. This is a must visit especially if you are already at the Elephant Falls because it is right next door, and it is free. 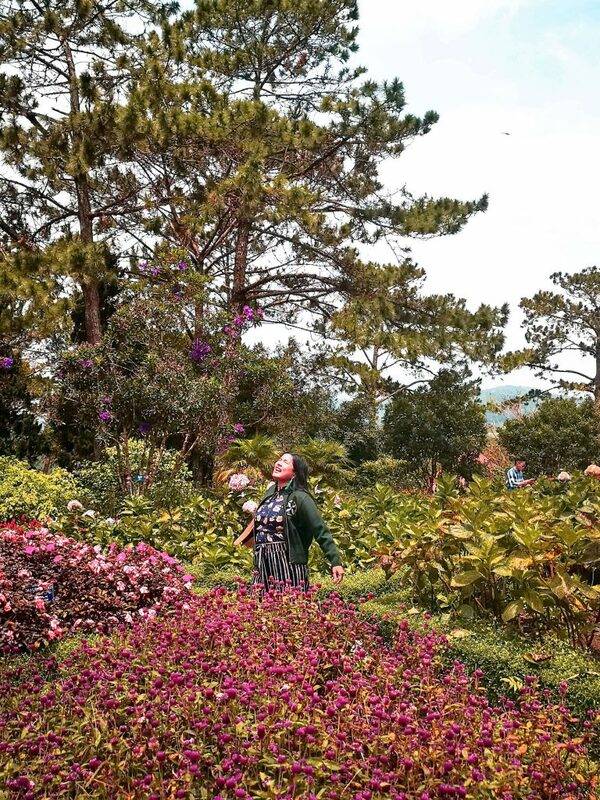 There is a flower park near the lake and because of the favorable climate in Da Lat, there is a good variety to see. They have fountains, dragon shaped shrubs, and more. Entrance fee is around 1.5 USD. We opted to skip this as we have been to a lot of Gardens in Portland, Amsterdam and Canada. If you love flower gardens, this is quite pretty. 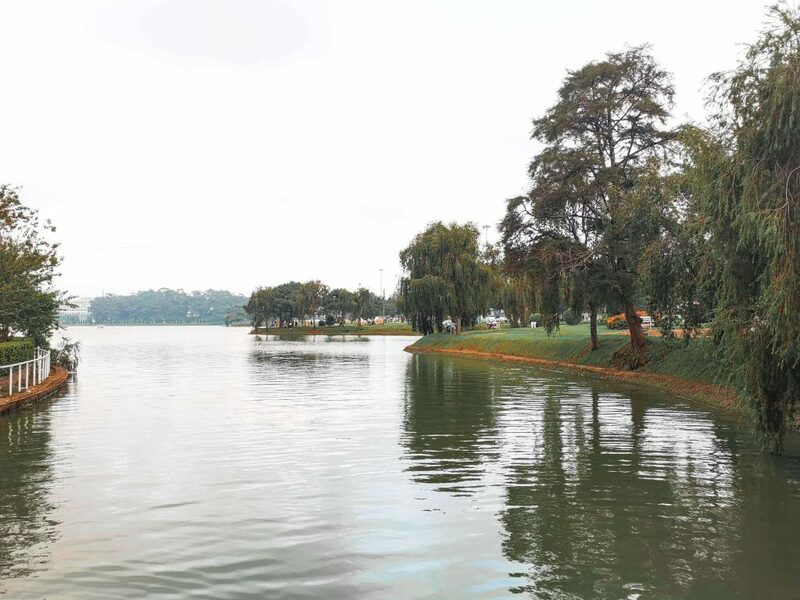 Xuan Huong Lake is the main lake in Dalat, specifically located west of the old train station. The lake is surrounded by gardens, street food stalls and bars, and restaurants. 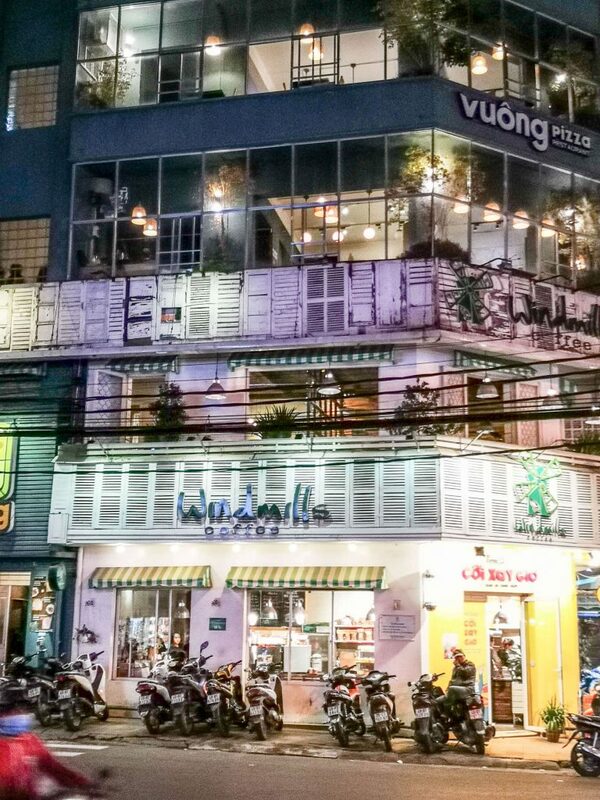 Don’t be surprised if the restaurants are a bit pricey compared to other places you’ve visited in Vietnam. I guess they include a premium for the scenic view. In the waters of Ho Xuan Huong Lake, you can ride swan-shaped boats which you’ll need to paddle. Like Xuan Huong Lake, Tuyen Lam Lake is scenic. The adventure it offers is a bit more exciting; around it are hiking trails of different difficulty levels. Tuyen Lam Lake is not an ordinary lake. It has several branches, thus, appears like a bird claw from top view. You can explore this by paddle boat and kayaking. Tuyen Lam Lake is near the city proper. Lam Vien Da Lat Square is located in the middle of the city proper of Da Lat, fronting Xuan Huong Lake. It is like any regular park that is clean, nice to walk around at, and with good ambiance. At Lam Vien Da Lat Square, you can easily see two unique structures. The first structure resembles a wild sunflower. It actually serves as a theatre that can seat an over 1000 persons. Meanwhile, the second structure appears like a giant artichoke which houses a cafe. Below the two structures is a supermarket which you can access through the wild sunflower building. It’s good to take a stroll in the park, chill or walk around the lake. Here, you can find the love of Vietnamese for food like traditional rice noodles, banh mi (local sandwich), and grilled Vietnamese pizza (thin rice paper with toppings). 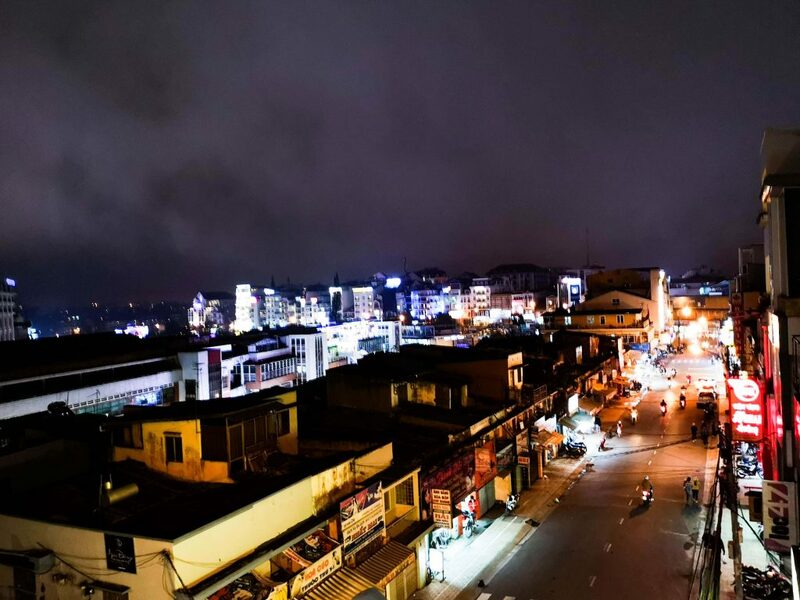 The Da Lat Night Market starts at 5 in the afternoon until 10 in the evening only. It is located in Da Lat city proper, within a walking distance from Xuan Huong Lake. 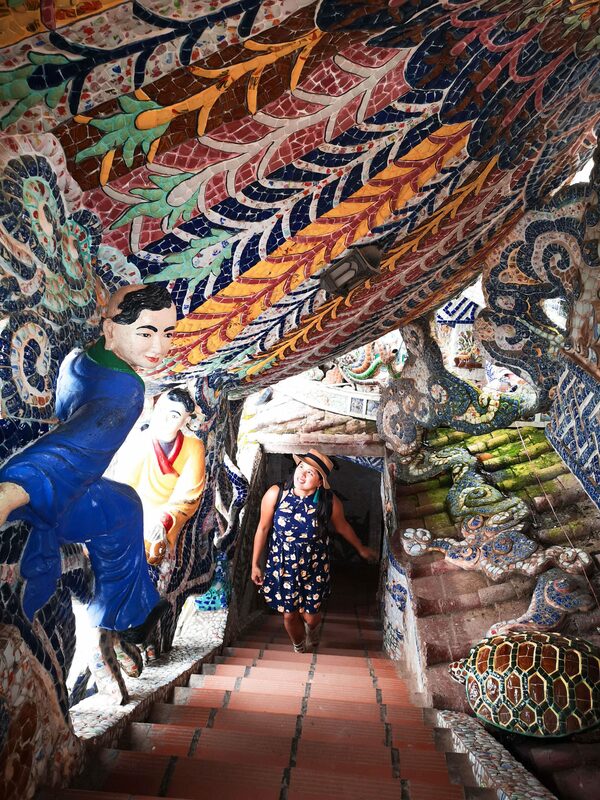 Another place to visit in Da Lat is the Clay Sculpture Tunnel, near the Tuyen Lam Lake. 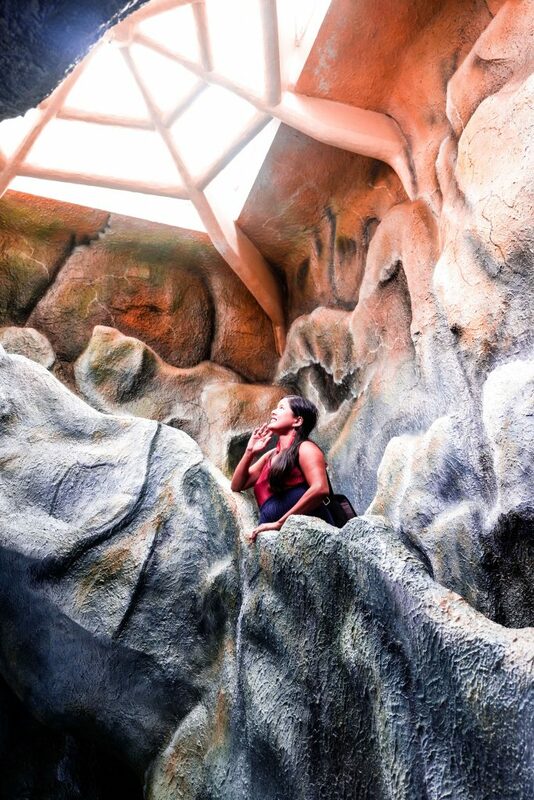 It features a collection of large and towering sculptures carved from red basaltic soil. 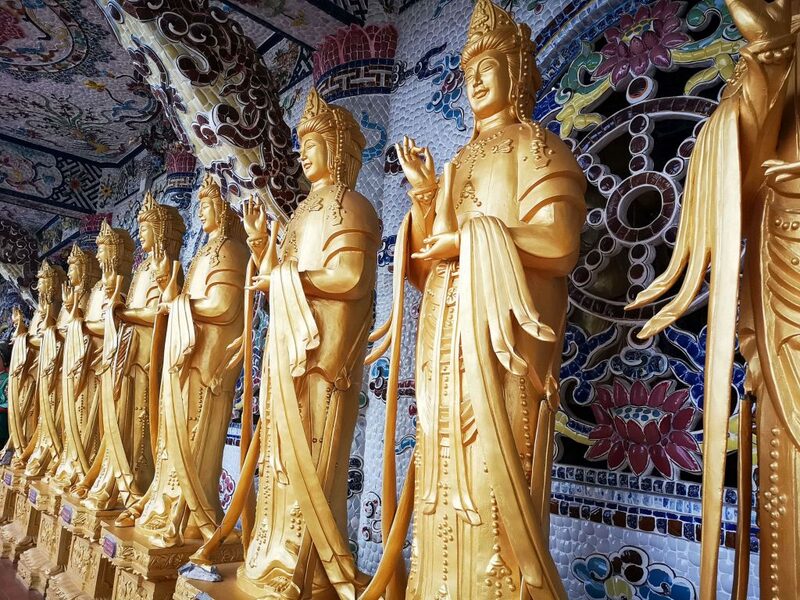 The sculptures depict the history of Da Lat dated 100 years ago, particularly its first inhabitants as well as some of their myths. In Mong Mo Hill, you can find special animals such as a buffalo with five horns, a pig with five legs, and a duck with four wings. 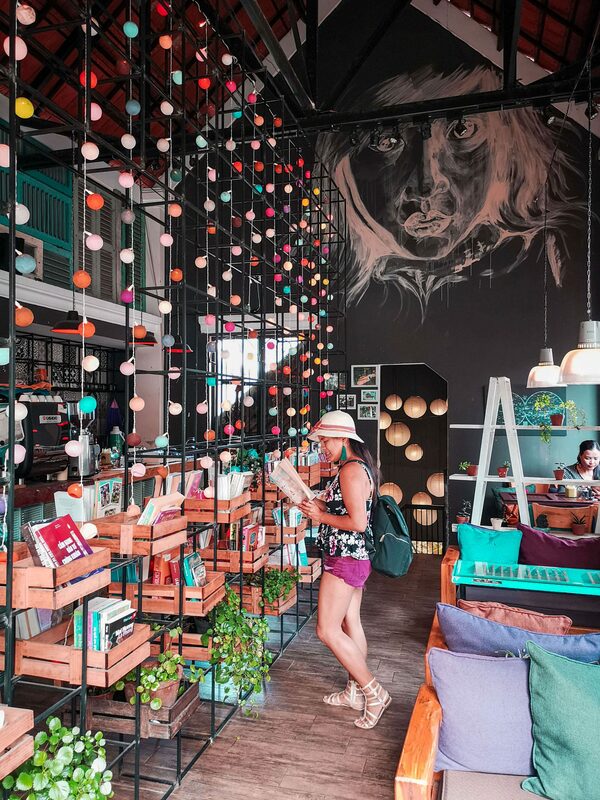 Not far from the Dalat city proper is the Circle hostel. Here, you may sleep in a room with a shape of a round tube, and have an overlooking view of a valley. 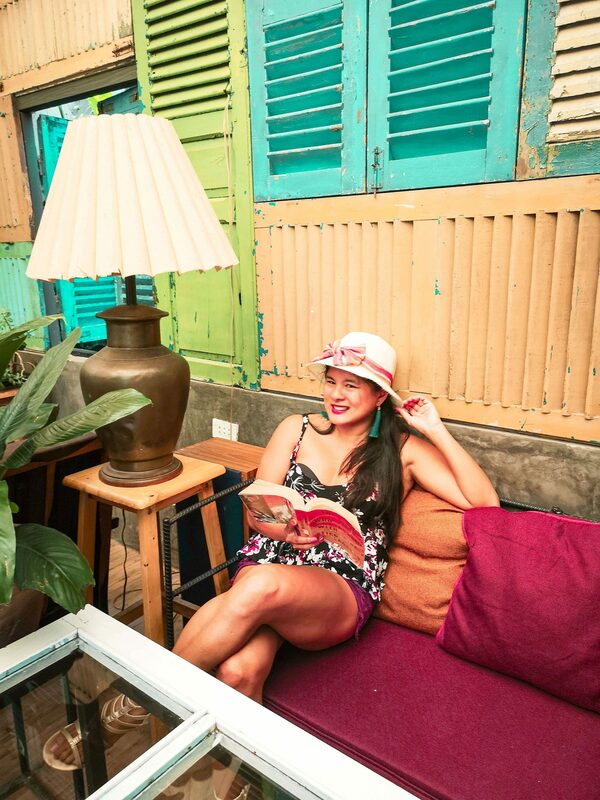 Still Coffee is a modest and lovely cafe located near the old Da Lat Train Station. Follow the road in front of station, and on its left, you will see another road leading to the cafe. Still Coffee is open from 7 in the morning until 10 in the evening. Prices on its menu range from 20,000 VND (0.86 USD/ 50 PHP) to 40,000 VND ( 2 USD/ 100 PHP). Here you will see a lot of bloggers, influencers, instagrammers and vloggers, so don’t expect extreme peace and quiet. When we were there, most knew how to wait their turn, and were pretty respectful of each other. Like Still Cafe, Maybe Blue Coffee is a chill place, though a bit more hipster. They offer indoor and al fresco setting. Maybe Blue Coffee is located just a few steps away from Crazy House. They brew and serve coffee made from beans sourced straight from local farmers. A cup of their coffee may cost at least 25,000 VND ( 1.07 USD/ 57.9 PHP). 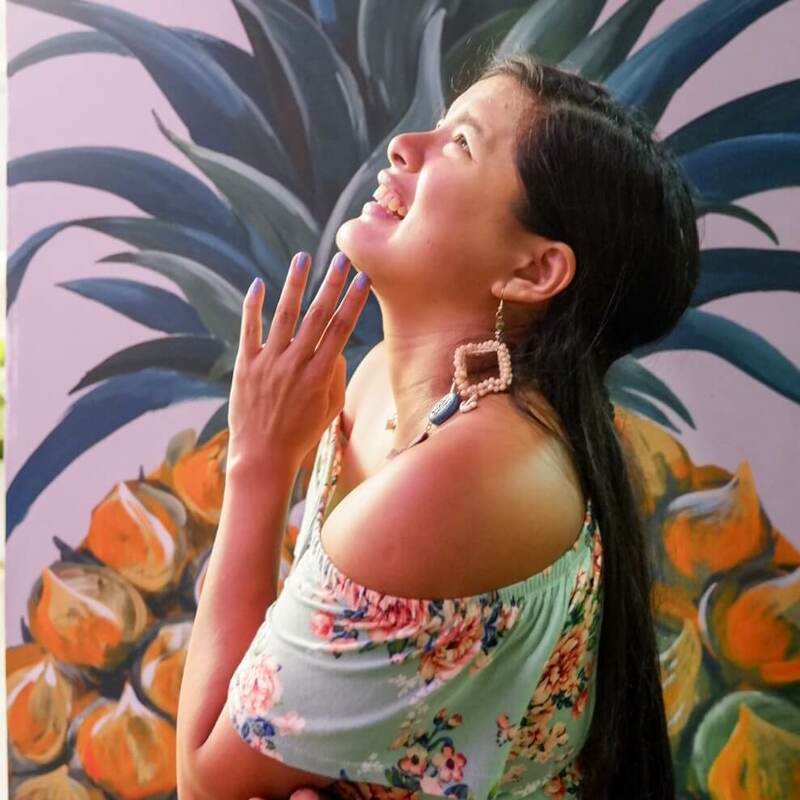 They also serve fruit-based drinks, cakes, pastries, and other sweet delights. Don’t expect alcoholic beverages, as they are not licensed to sell such. I personally liked this place better — a bit more relaxed and homey. 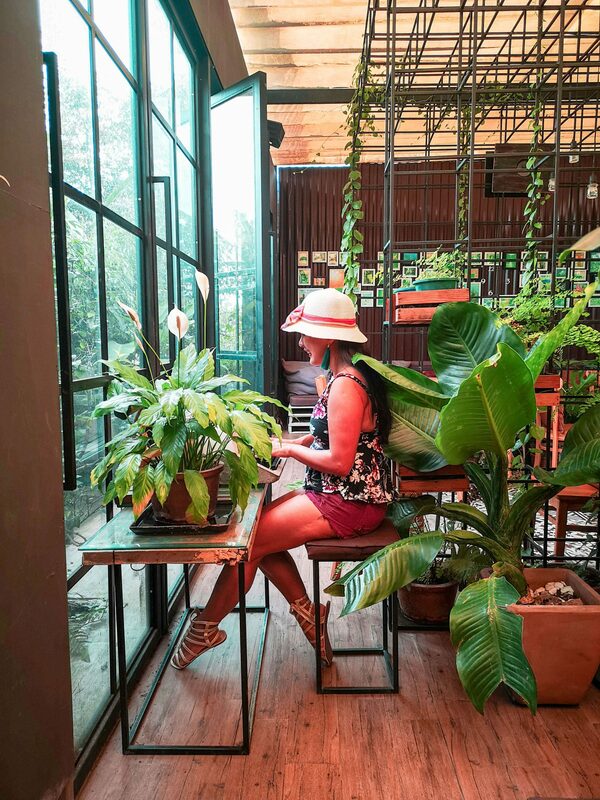 Just within the radar of Da Lat city proper, An Cafe exudes a serene atmosphere by playing calm music in the background and surrounding their guests with green plants. Some of these plants are veggies that are organic and are even served to their customers. On their menu, An Cafe offers different types of coffee which cost around 29,000 VND ( 1.20 4 USD/ 70PHP) to 59,000 VND ( 2.50 USD/ 140 PHP). In addition, there are fruit-based beverages, tea, yogurt, Vietnamese food, and a few European dishes. Windmills Cafe features retro-vibe interiors. Natural light comes in from its large windows, thus making you feel at home. A cup of their coffee cost around 32,000 VND (1.40 USD/80PHP). You can partner your coffee with matcha cake or brownies. Windmills Cafe can easily be reached from Da Lat city proper. WsTF (Where’s The Food) Da Lat Street Food Tour is a small tour agency managed by Binh. He is a go-to guy when you want to know ins and outs of Da Lat. The cost is around 20 USD (1,100 PHP) per person for a one-on-one tour, or 15 USD (800 PHP) per person for a group tour. WsTF will take you to hidden alleyways where you can find local food stalls, eateries, and restaurants selling authentic Dalat Street Food. It is similar to other Vietnam staple street food, but with a Da Lat twist on each. The WsTF Food tour usually starts at 5 in the afternoon or 7 in the evening, and takes up at least 3 hours. Meet up point is at your hotel or anywhere near the city proper. 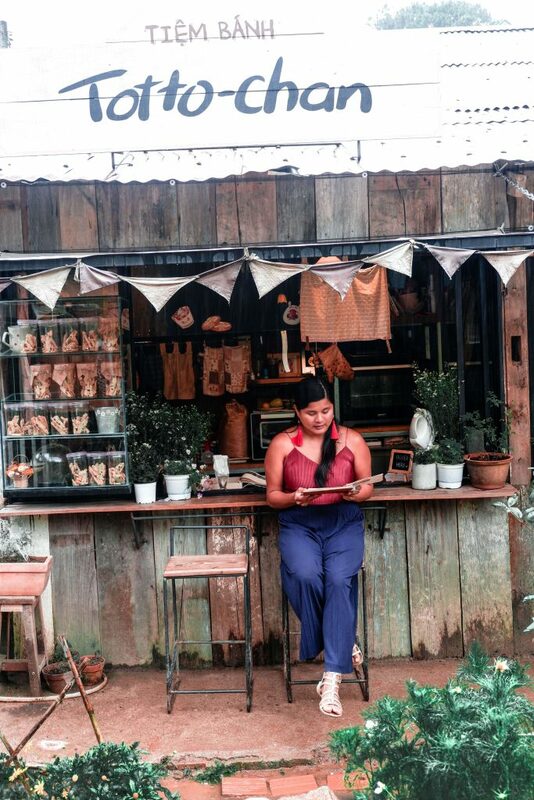 In an earlier bullet, some of the best cafes in Da Lat were mentioned. It shouldn’t be a surprise since Vietnam is one the largest coffee producers in the world. They grow different types of coffee beans, but the most expensive coffee they produce are the ones digested by the civet or the cat-like animal. To the Philippines and other parts of Asia, civet coffee is pretty common. products, primarily traditional Vietnamese clothing. Most of the products will be exported to China. At its first stage, you may cringe at the silkworm process. At the final stage however, you will surely admire its elegant by-products—-the silk threads. Crickets are commonly served as a snack in Vietnam. Don’t worry, these crickets they serve are well-raised in farms, like the chickens we eat. So, like chickens, the crickets are placed in a pen, arranged depending on their age. They are fed with banana leaves, and once they reach the right age, they are starved for three days. After that, they are ready to be deep-fried. 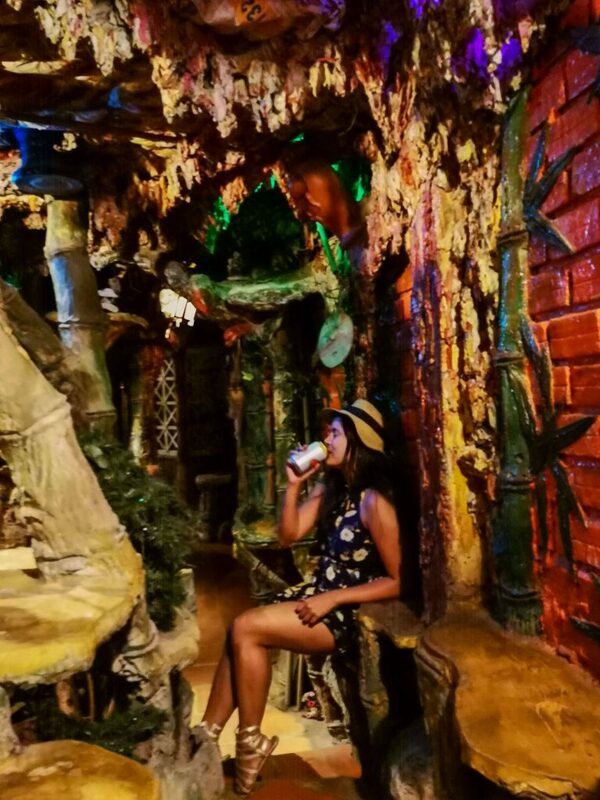 Da Lat Maze Bar is a whimsical place as it features several stairways leading to different rooms of different themes. It also features artifacts and ornaments. 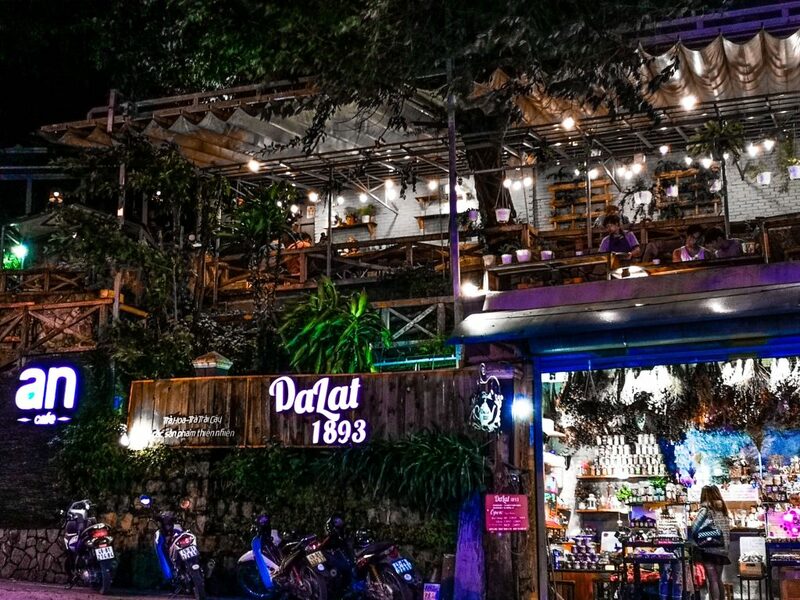 The real name of Da Lat Maze Bar is actually the 100 Roofs Cafe which is what most taxi drivers are familiar with. It is a cool maze bar experience that feels similar Crazy house. A lot of foreign tourists go here. There is no entrance fee but you’ll need to buy a drink first, so you can pass through the entrance. Its rooftop closes early at 9 in the evening but the rest of the bar is open until midnight. I paid 45,000 VND for a beer. The hotel we stayed at is run by a family, one of the sweetest we’ve met. They also have children who were so cute. The hotel had a balcony where we get a great view of the city of Da Lat. 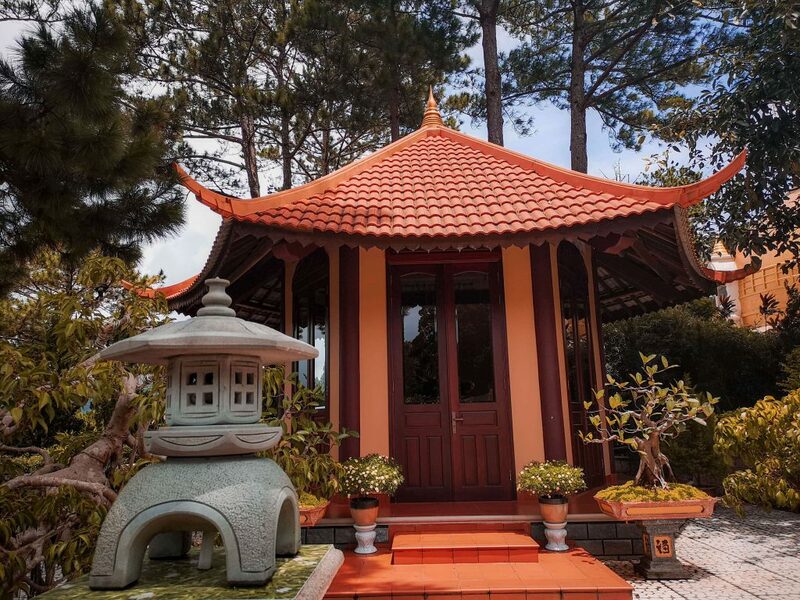 Da Lat is dotted with European-looking villas, making you feel like you’re not in Vietnam. 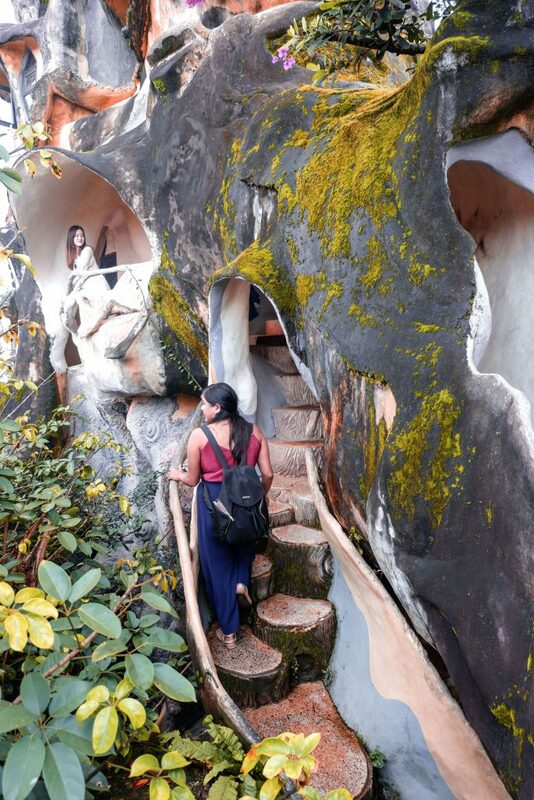 For other viewpoints, you can go up to Da Lat Pedagogy College, or hike up to higher terrain such as Robin Hills and Radar Hill in Langbiang mountain. In Dalat, most frequent rainfalls occur from June until August. Rainfall rate begins to subside from September to October. In November, rainfall is very minimal but the water level in waterfalls, rivers, and lakes remain high. That’s when you’ll most appreciate their beauty, especially that of the waterfalls. The same goes for the valley of Da Lat. It is during November when the hills are in its greenest form. Dry season continues until the month of March. We went in August. It was a bit rainy, was chilly in the mornings and in the evenings, but most of the afternoons were fine. Upon arrival of our bus from Mui Ne in Dalat, we rested in a bit since we had an early morning start. Thereafter, we had lunch(street food near our hotel), then went to Maybe Blue Coffee. From there, we headed to Crazy House, where we stayed for around 1 hour. By 5:30 in the afternoon, we proceeded to our Da Lat food tour, which ended by 10 in the evening. Exhausted but satisfied and happy with how our first day in Dalat turned out, Ruth and I decided to call it a day. After being early birds and on-the-go for our last tour, we decided to slow down a bit our second day. 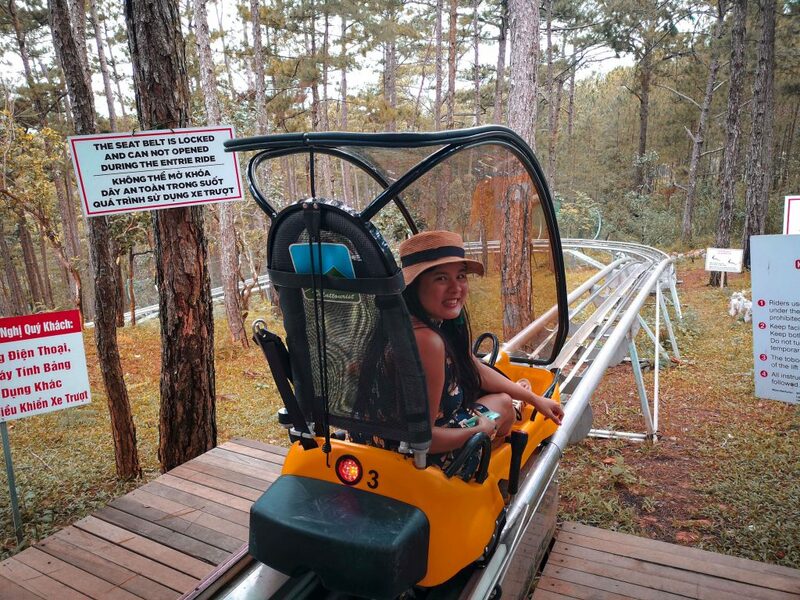 We checked other Da Lat tour packages available and noticed that most of the highly recommended tours in Da Lat start super early and pack a lot of places and activities in one day. On the contrary, we prefer to spend a good amount of time in every place we visit to truly digest and appreciate their beauty and value. Many tour packages also include stops that don’t interest us, so we thought it best to go on our own. From Robin Hill, you can take the gondola to the Truc Lam Monastery. We paid 60,000 VND (2.57 USD/ 138.96 PHP) for 1 way. You can pay 80,000 VND for return. Children price is 40,000 VND ( 1.71 USD/ 92.64 PHP) for one and 50,000 VND ( 2.14 USD/ 115.8 PHP) return. 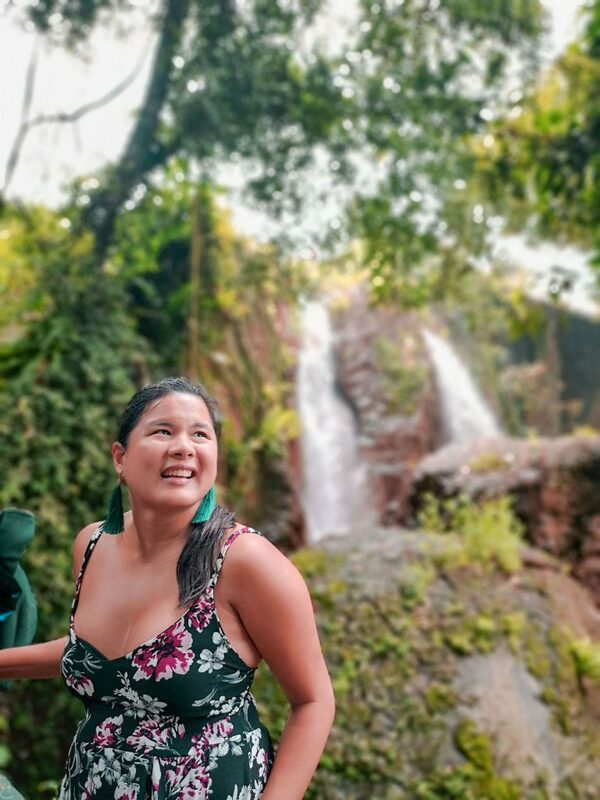 We took one way because we were heading to Datanla falls next, and that is nearer Truc Lam , so a one-way ticket was the best option. You may opt to walk to Datanla it’s like 1.5 KM or a 20-minute walk. If not, you can take a cab and pay 10,000 VND ( 0.43 USD/ 23.16 PHP). In Datanla, we rode the Alpine Coaster. 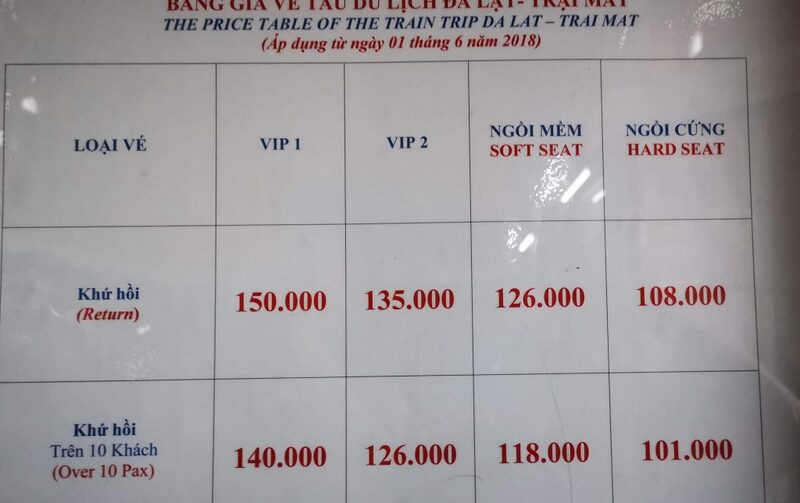 For a round trip, ticket costs 150,000 VND ( 6.42 USD/ 347.4 PHP). If you opt to hike down, you can buy a one-way ticket which will cost 100,000 VND ( 4.28 USD/ 231.6 PHP). You are not allowed to swim in the waterfalls. From there, we decided to take a cab to the Old Railway station. It wasn’t that easy to get a grab or a cab there, but I asked for help from the person in the high ropes stand. He was so kind and he called a taxi for us. We spent another 5 USD (270.7 PHP) to get back down to the city proper where Old Railway Station is located. 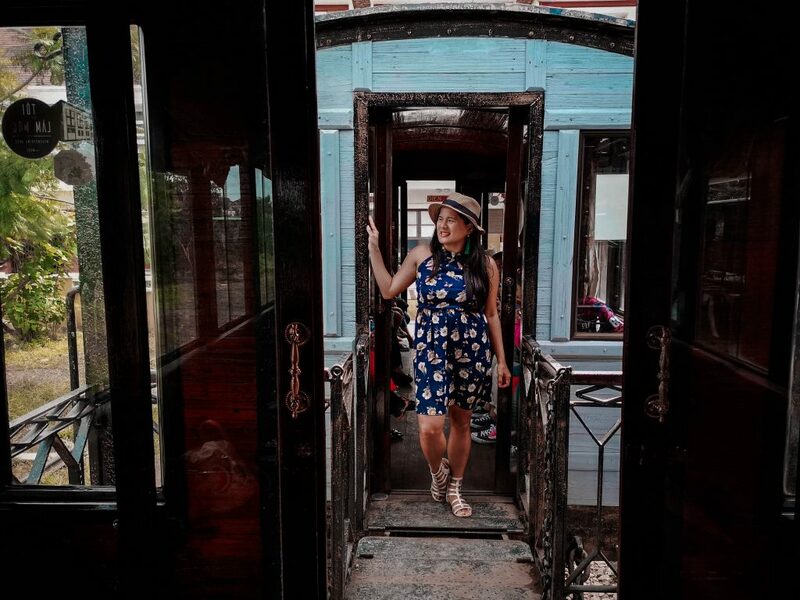 Da Lat Railway station is another photographic place and an experience in itself. We got there just in time for the 2:00 PM train leaving for the Linh Phuc. To get there, it takes 25-30 minutes. The road wasn’t as scenic as the Sri Lanka train, but you see a lot of greenhouses and the vintage train itself is Instagrammable. 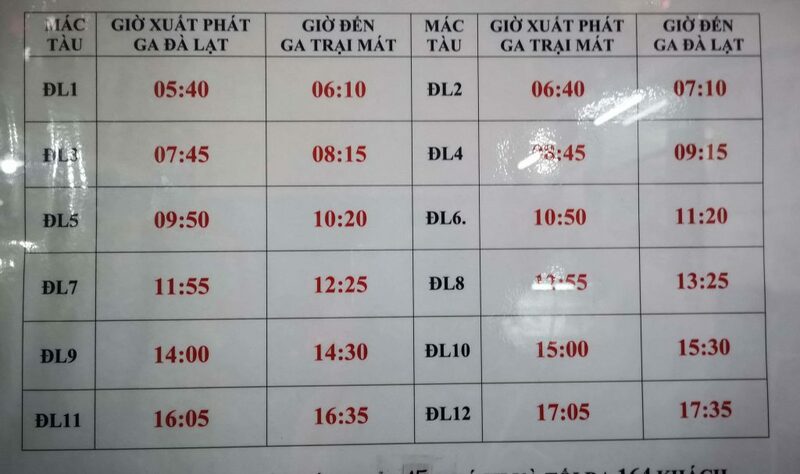 There are 5 train times to Linh Phuc, make sure to ask for the return. We got to the Linh Phuc Pagoda. Super pretty place. Small but looks like Gaudi. Very detailed. I felt like I was transported to Barcelona. Too bad we barely had 30 minutes here and we were enjoying the place quite a lot. From the train station, we walked 3 to 5 minutes to reach the pagoda. The place was lovely! Although we had to wait for the people to pass through, Ruth and I rushed our photo-taking session in the area. We only had at least 30 minutes in the area since the train had to return back to the main station. Back at the Old Railway station, we decided to take a 20-minute stroll around the lake where we saw swans, benches and people enjoying the park. We just continued following the path around the Lake and enjoyed the view until we realized we were back at our hotel. We rested a bit. After about an hour of rest, we walked and strolled towards Da Lat Maze bar. It was a good walk. Literally seeing a lot in the street——–Shops, coffee shops, cute things—- so it was good. 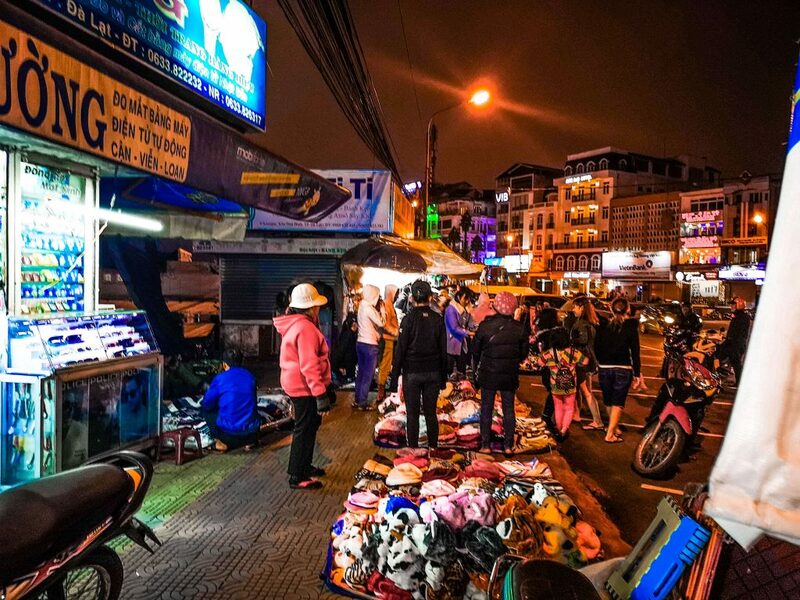 We even passed by the Da Lat night market where I bought a hat. Damn, I said no shopping. We ended the night in Da Lat Maze Bar, the coolest bar ever. You need to buy a drink as an entrance fee. 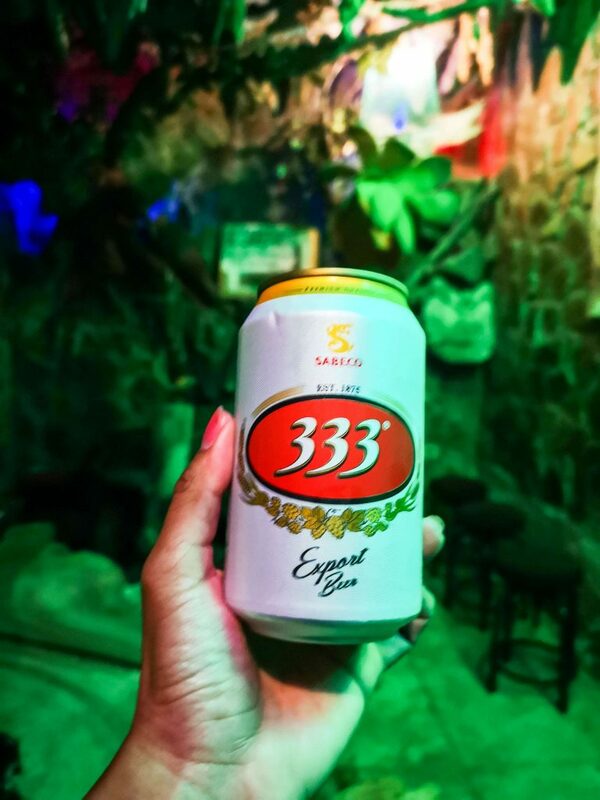 I bought beer 333 for 40,000 VND (2USD/ 100 PHP). There are other drink options but I just preferred beer. Ruth actually dropped her beer and it kinda popped. They gave her a new bottle, no trouble. How cool is that? Cool staff and cool place. We spent time in the maze as we were really amazed. There are lots of choices and it was really super cool. We spent some time here, you get to talk to people here if you want. It’s a cool hang out place. Ruth was exhausted though so we headed home and called it a night. Again, another chill day, we had till 4:00 PM before our bus to Hoi An picked us up. We wanted to see if we could do a tourm but again we only wanted just a few things so we opted for Elephant Falls. Fairly easy, we took the bus to Elephant Falls. We paid 25,000 VND ( 1.07 USD/ 57.9 PHP) each. The bus stop was literally beside it. Just tell them Elephant Falls and they’ll drop you off. Take the bus to Nam Ban village. In our case, our host wrote down the name of the Elephant Falls in Vietnamese in a piece of paper. So, we just showed it to the bus driver who without a doubt recognized the place. There were also a couple of tourists on the bus heading to the falls. From the bus stop, you’ll need to take a 5-minute walk to the falls. Entrance fee to the Elephant Falls is 20,000 VND (0.86 USD/ 46.32 PHP) per person. After 5 minute walk from the falls, you’ll have to hike down a short, slippery and strenuous trail. Ruth struggled since she was not wearing a proper footwear for the hike. It can be slippery so be careful. Along the trail, there was a blue railing which travelers can hold on to. After Elephant Falls, we headed to the tourist attraction next door which is the Lin Anh Pagoda and the Happy Buddha statue. We then ate lunch in one of the street food stalls. We weren’t happy with though. The bus back to the city proper frequently passes the starting trail of Elephant Falls every 30 minutes. We waited at the same bus stop and made our way back to Da Lat. Fare rate to go back to the city proper from Elephant falls is another 25,000 VND ( 1.07 USD/ 57.9 PHP) per person. This was a lot cheaper since we weren’t interested in the isle factory and cricket farm since we’ve seen a lot of it already. 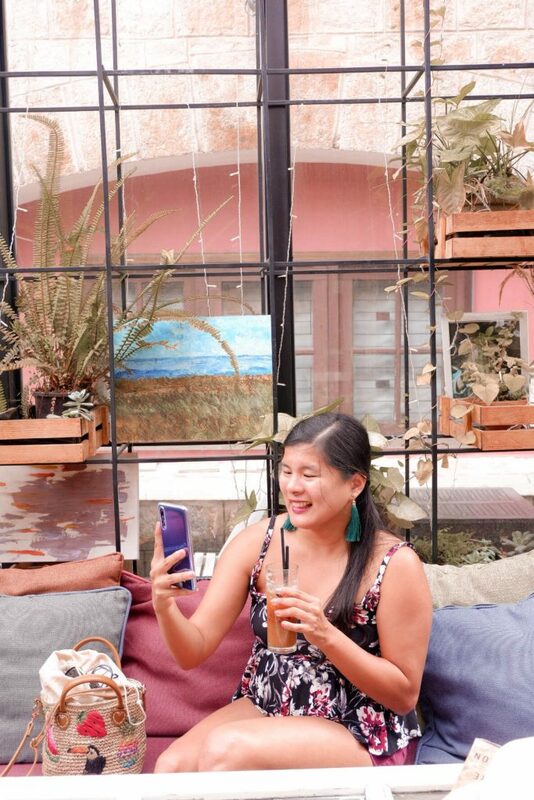 Back in the city, we decided to drop by Still Coffee for another Instagrammable coffee shop to try it. This one is also petty but it gets visited by a lot of people who line up just to take photos. Food is also more expensive than Maybe Blue coffee. I preferred the Maybe Blue One since it was cheaper, cute, quieter and laid back. After, we walked back to the hotel to gear up for our long bus ride. That makes our DIY Dalat. DIY tour in Dalat was very cheap and ideal if you are staying for a few days and want to do a lot. I recommend the Easy Riders Tour since they can help you squeeze a lot of places and activities in one day for you. Doing your DIY tour in Dalat in your own terms and pace is cheap. I feel like we saw a lot more. We got to spend a good amount of time in each place. We really love it. 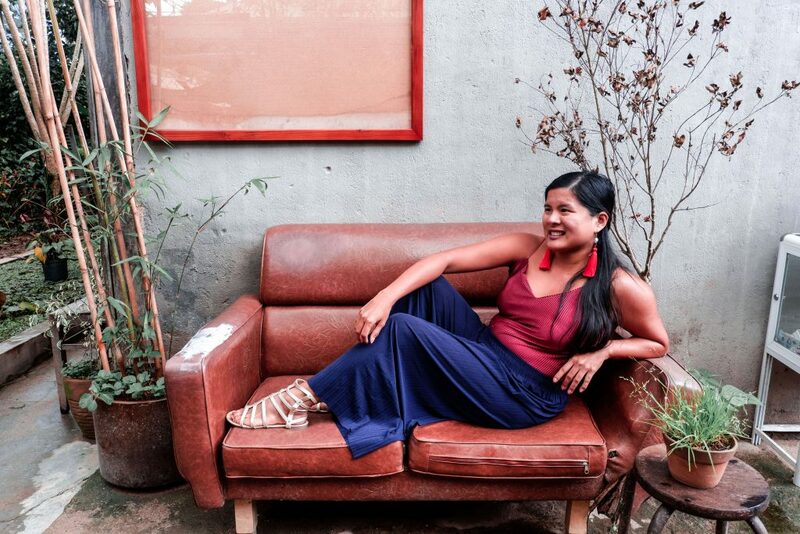 As much as possible, don’t miss a street food tour especially the ones curated by the WsTF. I loved the coverage of the tour a lot and highly recommend that you book it.